Described by its auctioneer as the "Picasso of the pink diamond world," the 14.93-carat "Pink Promise" set a record yesterday when it fetched $31.9 million at Christie's Hong Kong. The $2.13 million per-carat selling price was the highest ever paid for a pink diamond larger than 10 carats. The oval-shaped pink diamond — which had been trimmed down from 16.10 carats to improve its visual intensity and value — boasts the ultra-rare color grade of Fancy Vivid, near-perfect VVS1 clarity and Type IIa purity, the finest of all diamond types. After an exciting three-minute bidding process, auction watchers learned that The Pink Promise had narrowly missed the world record per-carat price for a pink diamond of any size. 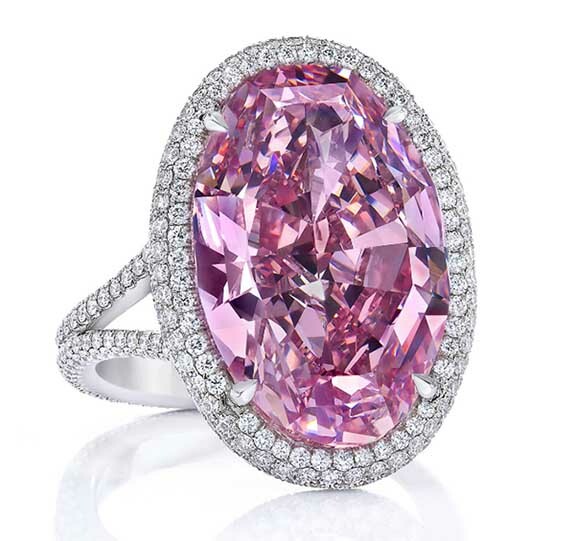 In 2009, Christie’s Hong Kong had sold a 5-carat Fancy Vivid pink, cushion-cut diamond for $2.15 million per carat. The 16.10-carat pink diamond that would become "The Pink Promise" had been graded Fancy Intense pink (a grade lower than Fancy Vivid pink), and was visibly "washed out" in some areas, according to Silicon Valley-based haute jeweler Stephen Silver, who had purchased the stone in 2013. Working with a master gem cutter for three years, Silver plotted a way to recut the gem to achieve its ultimate color potential. It was a risky move, because millions of dollars in carat weight would be trimmed away and there was no guarantee that the stone would earn a higher color grade. The gamble paid off as the Gemological Institute of America affirmed that the new, improved Pink Promise would have the highest possible color grade of Fancy Vivid pink — boosting the value of the diamond dramatically. "The work we did on this particular diamond was the most challenging recut in which I have been involved, due to the technical difficulty and large financial risk," Silver said. "It is a privilege, however, to work with a world-class team and have my name associated with one of the world's great gemstones." Christie's had estimated that The Pink Promise, which is set in a platinum ring and surrounded by smaller white diamonds, would sell in the range of $28 million to $42 million. Credit: Image courtesy of Stephen Silver.